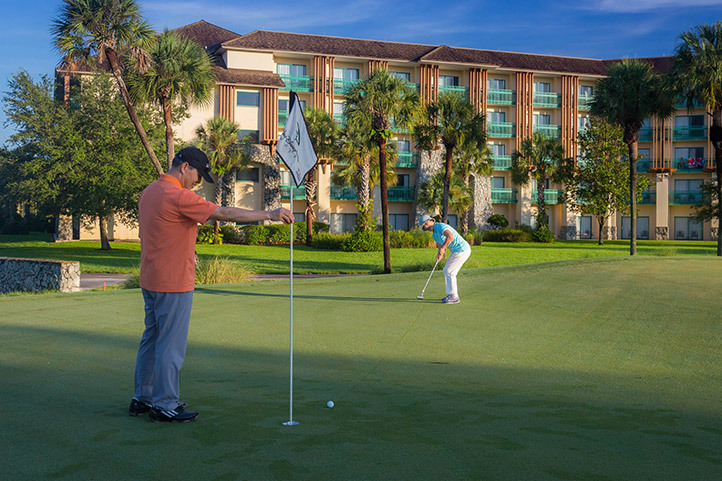 Shades of Green has family fun of every stripe, and we are proud to take full advantage of our scenic location nestled between two world-class PGA golf courses. It’s perfect for golf enthusiasts, novices, juniors and the whole family. Of course, we have special military discounts on tee times, equipment and clinics to make it even more fun to hit the links right here in Mickey’s backyard. * FootGolf is a precision sport; a combination of the popular sports of soccer and golf, but more closely related to golf. * Players kick a regulation #5 soccer ball at a golf course facility on shortened length holes with 21-inch diameter cups in as few shots as possible. * FootGolf rules are very similar to the rules of golf, and bunkers, hazards and golf course characteristics help to improve the challenge of the game. Anyone can play as it requires minimal prior experience other than your ability to kick a soccer ball. It is a great way to get some fresh air and exercise, enjoy time together with colleagues or loved ones, and have some fun and friendly competition at the same time! As you walk the 18 holes you’ll be accompanied by a selection of Central Florida’s finest wildlife. Turkeys, Armadillos, Deer, Ospreys and Hawks will all surround you as our golf course is part of the Audubon Cooperative Sanctuary Program which works hard to provide a healthy balance between economic advancement while maintaining and restoring wildlife habitats where they can live and flourish. For reservations, or additional details please call (407) WDW-GOLF (939-4653) or book online at https://www.golfwdw.com/footgolf. You are welcome to bring your own soccer ball, or utilize one of ours. Play as a single, or bring your friends/family and socialize! FootGolf is available currently on Wednesdays, Saturdays, and Sunday afternoons, after 2:30pm, subject to availability. Military personnel and family members are offered a rate of $19 per player, and that includes the use of a soccer ball, juniors are only $15 each. Recently redesigned by Arnold Palmer Course Design and rated the best renovation of 2015 by Golf Inc. Magazine, Disney’s Palm Golf Course is considered one of the most naturally beautiful courses in the country. Featuring strategically placed palms, 59 bunkers and many sparkling lakes and waterways, the natural Florida woodlands provide a stunning backdrop to one of America’s premier resort courses. Designed in classic Florida style, this championship course is the longest of the Disney courses. Sharing its landscape with herons, great egrets, alligators and deer, Disney’s Magnolia Golf Course is a certified Cooperative Wildlife Sanctuary by Audubon International. Featuring the world-famous Mickey Mouse bunker, it presents a challenge for serious golfers, as well as a paradise for players at all levels. Bring your whole family out for a unique golf experience everyone will enjoy. Certified by Audubon International as a Cooperative Wildlife Sanctuary, Disney’s Oak Trail Golf Course is a rolling hill 9-hole walking course best known for the wildlife that inhabits the scenic views along the way. Boasting affordable rates, junior teeing ground and complimentary US Kids Golf rental equipment, Disney’s Oak Trail Golf Course is the ideal way for the whole family to enjoy golf, fun and fitness. Offering a classic country club layout, Disney’s Lake Buena Vista Golf Course embodies the natural character of the land while winding its way through pastel villas, pine forests, palmettos, sparkling lakes and other wonders of nature. 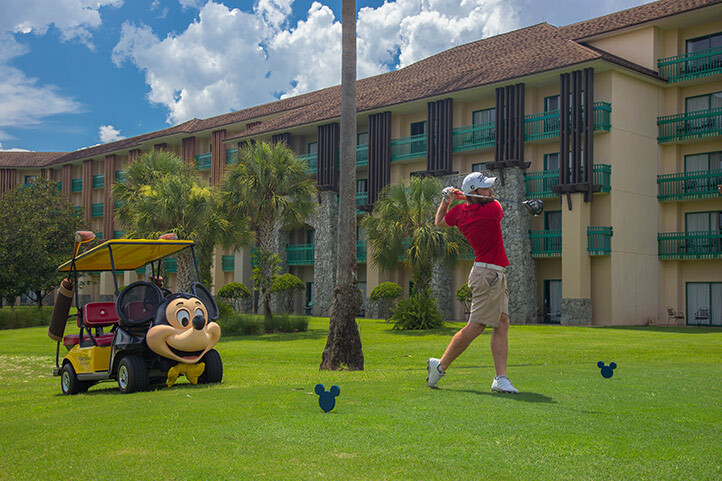 As the only Disney golf course that’s not directly accessible from Shades of Green, Disney’s Lake Buena Vista Golf Course is still nearby, and an easy free shuttle ride away. Sunrise 9: Enjoy an early morning 9 holes at any of our four courses before 8:30 a.m., including a breakfast sandwich as well as pre-round and post-round beverages, starting at $35 + tax. Sunset 9: Play a quick 9 holes before dusk and enjoy a hot dog and beverage on us. Tee off during Sunset 9 promotional hours at any of our four courses, starting at $29 + tax. 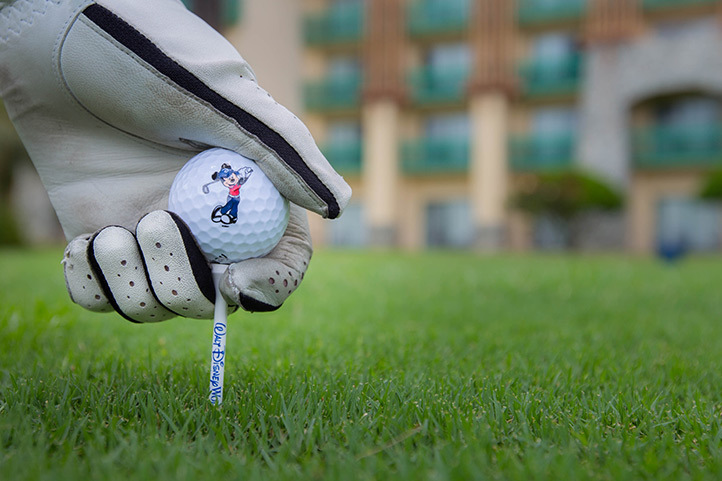 Learn some tips from Disney’s in-house PGA professionals. The instructor will customize each 45-minute session to your skill and experience level. These special military discounts are 15% less than regular prices. Call 407-454-5096 or email to schedule your private golf lesson. Half day and full day now available. Eligibility requirements 30 day booking window. A Military Guest is any member of the Armed Forces (Army, Navy, Air Force, Marines, Coast Guard, and Department of Defense, including reserves.) This includes both active and retired members. Members of the Military are not required to be staying at a Walt Disney World Resort Hotel to receive this rate. Note: these Guests may be from U.S. or Allied bases anywhere in the world. Rate Extends To: the Military Guest, spouse, dependent family members, and/or up to 3 non-Military Guests playing with the Military Guest. Payment: Guest pays at time of check-in. Verification or Identification Required: Military or Department of Defense I.D. Note: Junior rate is 50% OFF the morning Adult rate. Junior rate applies at ALL times of day, including After-10am, Super Twilight and Junior Replay. Others Eligible: Includes members of Canadian or British Military with credentials showing they are currently assigned at a U.S. base anywhere in the world.